I am really curious in what order the restaurants were built. I am pretty sure the first one was in Eldon MO, but where was the second one. When did the big red roof concept come into being? What was the last one to open. I would love some history on the subject. There is some info at: http://web.archive.org/web/20071101080637/http://members.aol.com/sum41angel02/competitors/nickerson/nickfarms.htm. This is a Stuckey's site, also an interesting place. Thanks in advance for any information. Now I have fond memories of NF. But when I was little it scared me to death to park by the bee hive opening and it seems like my dad always parked close to it. The fresh bread and fresh honey were soooo good. NF is the reason I now keep bees! Their observation hives fascinated me as a child! I do remember the coloring books w/the queen bee! There is still one standing at exit #77 off I-29 just north of Omaha NE. It was another restaurant for a while in 1999 but it also closed. Too bad. Lots of childhood memories there! 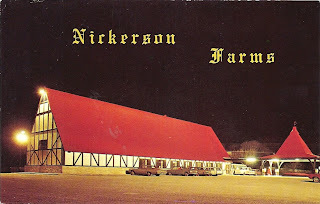 Mr. Nickerson's first store was in Columbia, Missouri. He retained this store when he sold out and changed the name to Grandpa Nickerson's. I worked at the Platte City, MO store, as well as alot of my family did. I also worked in Hinton, OK store and Marion Ill, which was a Farmer's Table restaurant.